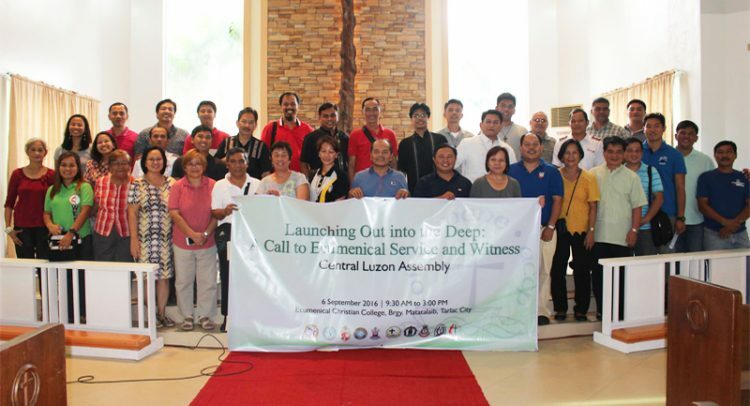 In an effort to address the challenge of disaster response in their region, church leaders and lay workers from NCCP member churches in Central Luzon and Pangasinan officially formed the Pangasinan and Central Luzon Ecumenical Assembly (PACLEA) last September 6, 2016 at the Ecumenical Christian College in Tarlac City. “The challenge of disaster response in the region ignited the fire in the church leaders and workers to answer the call by initiating the formation of a regional ecumenical council in Central Luzon. As a result, PACLEA was born,” said Fr. Gilbert Garcia, a newly-elected provincial coordinator of the formation. “Churches have a unique part to play in humanitarian work. We realized that we are placed in a strategic role that caters not only to the spiritual thirst of the people, but also to the masses’ hunger for human dignity,” he added. Ms. Minnie Anne Calub, NCCP Emergency Program Manager, shared the NCCP’s Disaster Risk Reduction Quadrennial Goals and Localization Agenda of the Council to the participants. “The NCCP Disaster Risk Reduction Quadrennial Goals and Localization Agenda should challenge member churches to answer the call to the prophetic ministry to proclaim climate justice and to the ministry of service in order to meet the needs of the victims of human-induced climate change and natural disasters,” Calub said. It was also emphasized in the assembly that the mandate of the humanitarian imperative for Christians rests on Jesus Christ’s compassion for the people. “While the others are telling him to send the crowd away, his command was to feed them (Luke 9: 12-13). The core of Christ’s ministry is to respond to the cry of the people and to cater to their spiritual and physical needs, especially of those from the marginalized sectors,” shared by the NCCP General Secretary Fr. Rex RB Reyes Jr.
Sr. Cecille Ruiz, the Executive Director of Alay Bayan, Inc., concluded the event with her words of solidarity to the ecumenical assembly. “With the formation of the ecumenical assembly, we are entering something bigger; we are embarking a meaningful journey towards justice and peace,” she ended.